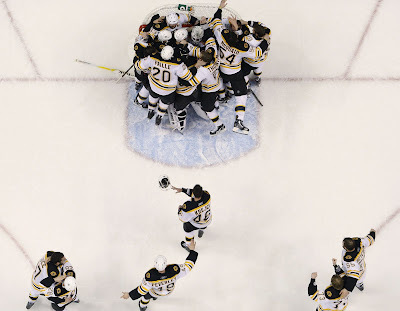 The Hockey Blog Adventure: 2011 Stanley Cup Champion Boston Bruins: YES!!! 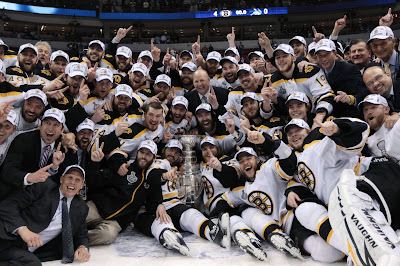 2011 Stanley Cup Champion Boston Bruins: YES!!! This is one of my favorite pictures, all-time, of the cup. It's not from when the Bruins won it, but it says it all: The year's done. It's over. No more games. No more practice. Just off-season workouts, spilling champagne, and a parade. In the coming however-longs, I'll be putting up retrospective pieces on the playoffs, since I didn't want to jinx anything with a post. As you can see, the Bruins dropped 2 at home right after my last post. Anyhow, what I'm saying is high-res images are on their way. These pictures really say it all: Victory.